The species has a scattered and patchy distribution in the southern half of Britain as far north as Anglesey, with one old record for East Lothian in Scotland. It is widespread in western and central Europe, but has not been recorded from Scandinavia or Ireland. A species associated with sand-hills, coastal grasslands, estuarine habitats and occasionally inland grassland habitats. 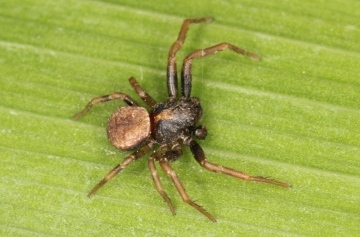 In central Europe, this spider may also be found in fens and reed-beds (Hänggi et al. 1995). Adults of both sexes are found mainly from May to July, females occasionally into the autumn and winter. Local but the spider may be frequent near the coast in the south-east. Threats are likely to include loss of open habitats to seral succession and agricultural improvement of grasslands. Rotational management or low level grazing is probably necessary at many sites to maintain structural diversity and prevent seral succession.